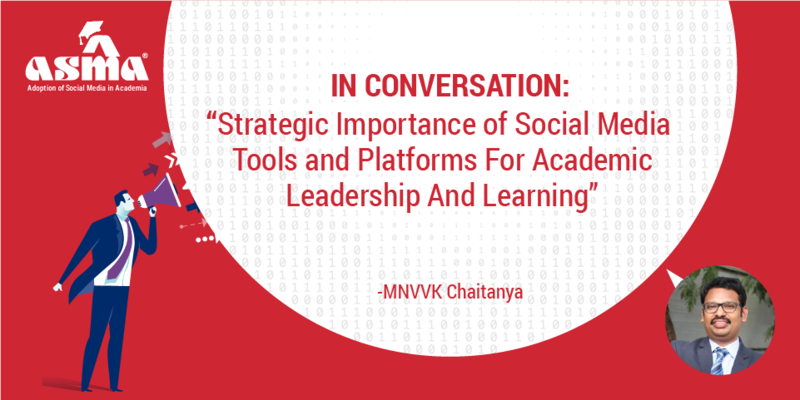 In a candid conversation with ASMA, Mr. MNVVK Chaitanya from Annapurna International School of Film and Media (AISFM), Hyderabad shares his first-hand experience about the emerging role of social media platforms in fostering leadership, and how they can creatively contribute to the learning and curriculum development in institutes. ASMA: How important is social media for a media school like AISFM? Answer: AISFM is a not-for-profit institution and Master of Media Business Administration (MMBA) has a very compact program (with a limited batch size of 20 students, in accordance with University norms), financial budgets are very meager and limited. For us, at the department, social media is indeed a way of life and is coalesced into departmental operations, academic planning and student communication activities on real-time and continuous basis. Just to share an example, all the guest lectures that we did in the last academic year (about 40+ lectures) were because of active LinkedIn usage and reach. ASMA: How do you leverage social media platform like LinkedIn? Chaitanya: I persuade and motivate all my students to ask questions to experts and influencers, specifically regarding career opportunities, career counseling, fitment of jobs and roles and most importantly to reach out to all HR heads and HR teams for exploring live projects, internships and final placements. Many are already on LinkedIn (which is a mandatory option for them and I personally take interest in activating their LinkedIn accounts in first semester itself). Unlike the other schools, this focuses only in second year or last semester, we at AISFM try to make it more structured and seamless by approaching social media in a calculated and deliberate manner. ASMA: How do you use social media to undertake industry interface? Chaitanya: For the fact that film business is (relatively more) thriving in Mumbai and print/ communication is more active in New Delhi, we overcome the geographical disadvantage of being located in Hyderabad by using virtual education/ social media education options. For a niche subjects like Trans-media story-telling, International Film Co-productions and Film Distribution, we identify, source and engage Subject Matter Experts using Twitter and LinkedIn. By looking into, and specifically searching for, search fields like ‘Skills’, ‘Experience’ ‘Certification’ and ‘Geography’ the search for adjunct faculty, workshop faculty and visiting faculty becomes very easier, faster and most importantly cost effective. ASMA: Can you give any definite success cases or use cases of social media adoption for curriculum development or marketing of the course? Chaitanya: Whenever a faculty participates in any top-tier industry events and conferences like FICCI FRAMES, NFDC FILM BAZAAR, AFAQS or All India Media Educators Conference etc, they make it a point to post the planning information, prior to the event (mentioning the dates, time, availability and purpose of participation), updates during actual participation in the event and key learnings and final outcomes after the event in LinkedIn, Twitter and WhatsApp groups and etc. This kind of aggregation and dissemination about structured networking activities really paid off well for the faculty, department and the school in the form of faculty recruitment and selection, faculty learning, deeper connect with industry heads and HR teams, better brand building, and etc. The school has a dedicated and centralized content marketing staff, taking care of all the myriad courses that school offers in undergraduate, post graduate and diploma categories, in long and short formats. The MMBA department closely works with them to post the real-time updates about what happened in Master Classes, Guest Lectures, Workshops, Inter-College and Intra-College Competitions, Alumni Success Stories, Placement and Internship updates and other important campus information. On daily basis, the content team updates the YouTube, FB, Instagram, Twitter, Website and other allied digital and social platforms. ASMA: How social media can help your students study much better? Chaitanya: Social media in academics is no longer has to be an obstacle to studying; it can help students create and manage a study community, make the best use of study time (more so, outside the classroom environment), and find new resources to help them continually learn and ably retain knowledge. We created WhatsApp groups batch-wise (one for each year/batch), moderated and led by internal faculty, wherein and whereby, the subject related information (as published outside the textbooks), major and relevant events in the Hyderabad city, curated and share-worthy industry news and allied issues are being posted. In LinkedIn, we use subject hastags like #MMBA #filmeducation #filmbusiness #filmmarketing #mediaeconomics #filmdistribution and other subjects (that we have in the curriculum) effectively to identify, classify, disseminate and share the subject related topics and issues. This guest post originally appeared in 5th ASMA India Trends Study 2018. Download the full report to discover latest trends and best practices of how academic institutions and universities are adopting digital marketing and technologies for growth. Get your copy today!